This was one of those books that I had never heard of prior to picking it up off of the library shelf. But boy am I glad I did. Forgotten is such a wonderful story and the entire concept of the novel is very original. The idea of only being able to remember what happens in the future and forgetting the past is what drew me to the novel after reading the synopsis. It makes you wonder what a life with a flip-turned memory would be like. Imagine not being able to remember you're dating a hunky guy and get to relive 'love at first sight' every single day. The relationship between London and Luke was so real and true. They both had faults and quirks, and even though their love was rocky at times Patrick did a good job of making their budding-romance believable. Luke was such a down-to-earth guy and lovable, seeming like your average Joe, but there's just an allure to him that would make any girl wish to have one of him for their very own. 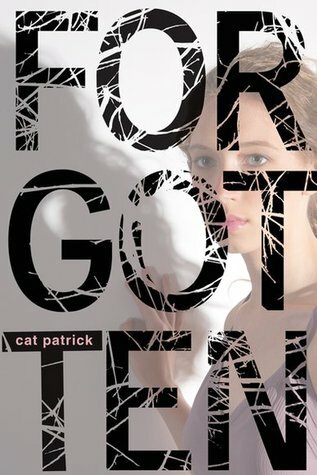 Forgotten had me staying up all night trying to read the whole thing because of how addicting it is. It draws you in from the very first page and has you wanting more until you read the very last words. Full of suspense, mystery, romance, drama, and tons of humor Forgotten is a tale you won't soon forget.